Esperanto Is Not Dead: Can The Universal Language Make A Comeback? 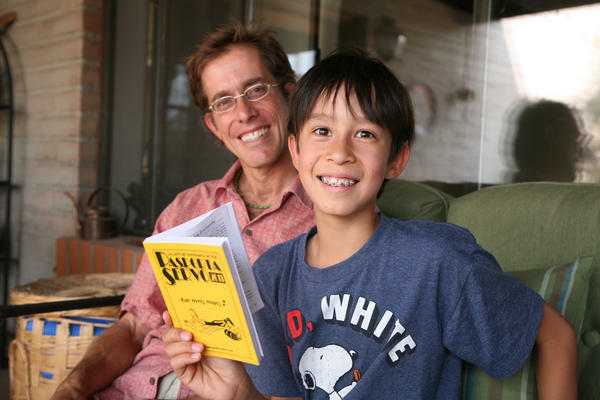 Greg Kay decided to raise his son Linken, 10, to speak Esperanto as his native tongue. When Greg was younger, he traveled around South Korea, biking between Esperanto-speaking homes. 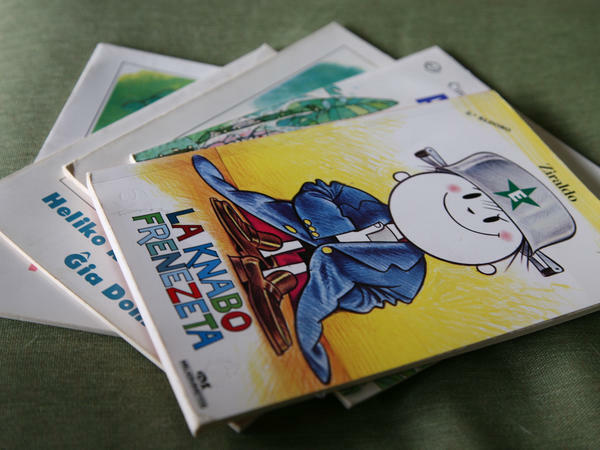 In their Tuscon home, Linken and Greg Kay have shelves full of books in Esperanto, including these picture books. In his Tucson, Ariz., backyard, 10-year-old Linken Kay throws a ball for his dog, Harley. The dog speaks only English. But Linken was raised speaking another language. "Li ŝatas salti en la naĝejo por preni la pilkon," Linken says. "I said, um, he was going to jump in to get the ball," Linken explains. "And he likes to jump in and get the ball." Linken is a rarity: He's a native speaker of Esperanto. More than hundred years ago, a Polish physician and inventor had an ambitious idea: Create a language that anyone could learn easily. The hope was to promote world peace through a universal tongue. It took several decades, but eventually L.L. Zamenhof designed Esperanto. Although the language hasn't become as popular as Zamenhof hoped — or brought world peace — it's estimated that anywhere between 200,000 and 2 million people speak the language worldwide. Devotees say Esperantists exist all over the globe, with especially large pockets in Europe, as well as China, Japan and Brazil. The popular language-learning platform Duolingo is even about to issue an Esperanto app. But there are only about 1,000 native speakers, like Linken. Esperanto was his first language — and still the main one he uses with his dad, Greg Kay. Greg fell for Esperanto when he was his late 20s and going to school in Japan. "Having lived abroad, I realize that the language barrier is a significant barrier, and can create many misunderstandings," Greg explains. He used Esperanto while traveling when he was younger, bicycling between Esperanto-speaking homes in Korea. He used a free hospitality network, called Pasporta Servo, which lists Esperanto speakers willing to open their homes to fellow Esperantists. Pasporta Servo still exists today. "Thanks to Esperanto, I've met many people that I would have just passed by otherwise — many fascinating people," Greg says. Esperanto creates a kind of "level playing field," because it's a second language for almost everyone who speaks it, says Humphrey Tonkin, an English professor at the University of Hartford in Connecticut. He taught himself Esperanto at age 14, and then used it to travel across Eastern Europe and beyond. "The result is that you're kind of lifted out of your own cultural limitations," Tonkin says. "And you're really in an authentically international environment." That was the hope of Esperanto's founder, Zamenhof. He wanted to bridge differences between people, especially religious differences, Tonkin says. Zamenhof was Jewish, and many of Esperanto's earliest adopters were also Jewish. They connected with this new language that emphasized equality, Tonkin says. So many years later, the language has grown far beyond Europe's Jewish community, but hasn't taken off as Zamenhof envisioned. When Zamenhof died in 1917, Tonkin says he was "deeply disillusioned." It's hard to know what it is about Esperanto that has kept it from blossoming, but Tonkin calls it a language of "low prestige," one that's still a bit hard to explain to those who've never learned it. "When I say that I speak Esperanto, they say, 'What do you do that for?' since I appear to be a perfectly normal person in every other respect," he says. "Or they say, 'I heard about that once. That died, didn't it?' "
Not only has it not died, but Tonkin thinks it might actually be growing, though he says it's hard to gauge an accurate number of speakers. Even if Esperanto's reach is static, the language has survived against some steep odds. The rise of English could have easily killed it off, Tonkin says. Or it could have faded away during both world wars, when its speakers were persecuted. But Esperanto kept going, and Tokin thinks idealism probably had a good part in it. At this point, learning it is kind of, "dare I use the word — a utopian thing?" Tonkin says — especially since the world is full of problems. "That's all the more reason for hanging on to those things that will make the world a better place," he says. "We just need to get together better, and maybe Esperanto is one of the ways we can do it." Copyright 2015 KJZZ-FM. To see more, visit http://kjzz.org/. WILLIAM SHATNER: (As Marc) (Speaking Esperanto). That is William Shatner in the 1966 horror movie "Incubus." He's speaking Esperanto. You may have never heard of it, but Esperanto was supposed to be a universal language. Over a hundred years ago, some dreamers invented Esperanto in hopes of creating world peace. Unless this is the first time you've turned on NPR, you know that hasn't happened. But there are still some diehard Esperantists out there. Stina Sieg of member station KJZZ in Phoenix paid some a visit. STINA SIEG: Ten-year-old Linken Kay is throwing a ball for his dog around his backyard pool in Tucson, Ariz.
SIEG: Harley only knows English, but Linken was raised speaking like this. LINKEN: I said that he was going to jump in to get the ball, and he likes to jump in and get the ball. SIEG: Lincoln is a rarity, even within the Esperanto community. It's estimated that anywhere between 200,000 and 2 million people speak the language worldwide. But there are only about a thousand native speakers, like Linken. Esperanto was his first language and still the main one he uses with his dad, Greg Kay. GREG KAY: Having lived abroad, I realized that the language barrier is a significant barrier and can create many misunderstandings. SIEG: Greg used the language while traveling when he was younger. In fact, the free hospitality network he used then still exists. It's called Pasporta Servo and it lists Esperanto speakers willing to open their homes to fellow Esperantists. KAY: Thanks to Esperanto, I've met many people that I would've just passed by otherwise - many fascinating people. SIEG: Humphrey Tonkin is a professor of humanities at the University of Hartford in Connecticut. He's also been an Esperanto speaker since he was 14, when he taught himself. He says Esperanto creates a kind of level playing field because it's a second language for almost everyone who speaks it. TONKIN: The result is that you're kind of lifted out of your own cultural limitations. And you're really in an authentically international environment. TONKIN: ...Dare I use the word - a kind of utopian thing. SIEG: Especially since the world is full of problems, he says, many of them getting worse. TONKIN: But that's all the more reason for hanging on to those things that will make the world a better place. We just need to get together better and maybe Esperanto is one of the ways we can do it. SIEG: Back in Tucson, Greg and Linken Kay aren't talking about world peace, but the baby birds living in a nest outside their house. Greg jokes that when Esperanto is made the official language of the U.N., raising his son this way will be validated. More seriously, though, he says he has no regrets about giving Linken the gift of this language. KAY: Again, a language that perhaps is not going to give you any sort of monetary reward in the future. SIEG: It's a different kind of reward. KAY: It's a different kind of reward, exactly. And oftentimes, a much richer reward. SIEG: And one that Linken might share with his kid someday. 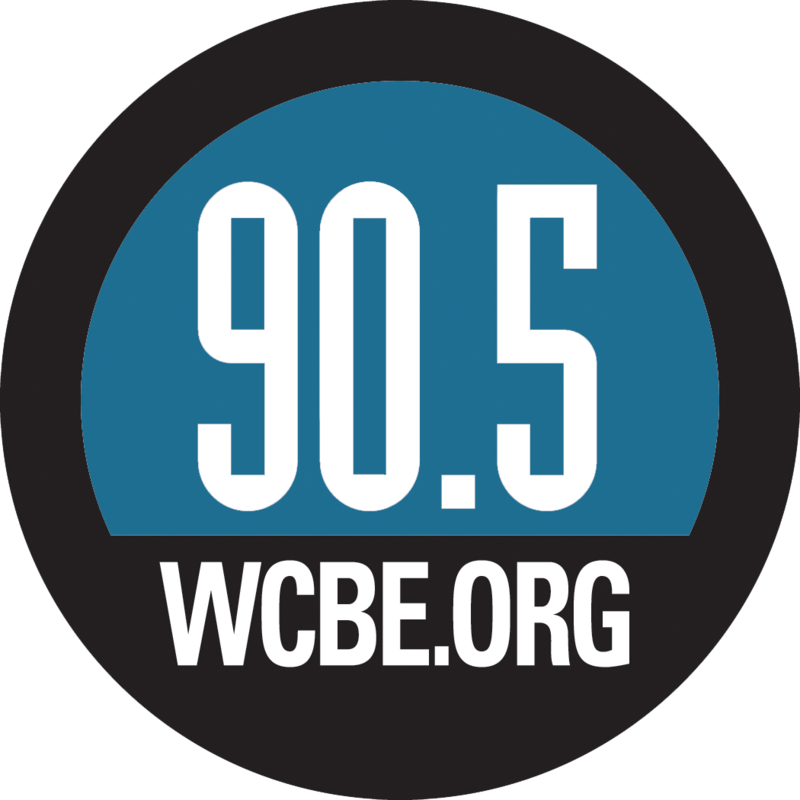 For NPR News, (speaking Esperanto) Stina Sieg. Transcript provided by NPR, Copyright NPR.